They’re everywhere. You’ll have seen one. You’ll probably have smelt one. You may even admit to having entered one. I won’t judge you, I know what it’s like. There is a time when nothing else quite hits the spot. The Fried Chicken Spot. Here in the UK we know no one does the fried chicken thing like the Americans, and no American does it quite like the Colonel. Sadly branding comes at a price, as does pumped and piped sugar based liquid refreshment. Free trade in the EU and cheap Lithuanian Pepsi resolves the latter problem, the former needs some creativity. Undeterred by not being American or wealthy enough for the KFC premium we have become a nation of chicken shop keepers. The names follow a certain pattern. The purists style themselves on KFC and take name along the formula <insert US state of your choice> Fried Chicken. The obvious one is taken of course, but calling yourself Minnesota Fried Chicken still has that essential sense of Americaness. No matter if Minnesota has no heritage of flash frying battery farmed water and hormone infused poultry. No matter if most Brits could not separately identify any US states on a map. It’s an American state and it’s got Fried chicken in the title. Order up a hundredweight of cardboard food boxes from Cost Co and lets do business. The only one I haven’t seen is Milwaukee, possibly because it is so hard to spell. The heretics pour scorn on this. No US aping for them. Theirs is the new religion, the one that looked across the road at Pizza Hut and thought “now there’s a way to name your restaurant: the food it serves and some form of dwelling.” The acolytes of this radicalism are the Chicken Huts, the rectors and preachers are the Chicken Villas, and top of the tree, king of the hill, father of them all is Chicken Spot. You know the feeling. Bad day at work, dinner with friends that love to experiment in the kitchen, a day with a “y” in it, something happens and as you walk past the door out wafts the smell of stuff cooked in oil. Drowsy neurons in your head make a sudden connection, by passing your memory centre of every other time you ate there, and you walk in. There’s chicken. There’s burgers, but don’t waste time on them, they take longer to cook. There’s chicken. It is currently the year 28 AN (After Nando’s) so there is probably peri peri chicken too. Twenty minutes later there is grease on your fingers and on your chin. Your arteries are holding a strike ballot, it could go either way. Somehow the napkins are never quite strong enough. The oil has a particular chemical quality that turns it from lubricant to glue. You ask the surly guy behind the counter who can barely speak English (he might be native born, but he can still barely speak English) for one of those wipes that smells like Toilet Duck lemon. You succeed only in smearing the grease a little thinner and reminding yourself that sometime soon a lavatory is in your future because one way or the other this is not stopping in your system. And no matter how vehemently and passionately you swear you won’t be back, you will. Accepting the inevitable I have decided to improve the lot of man by setting out a quality measurement system for the purveyors of supposed gallus domesticus frixus. It has nothing to do with the chicken itself. That all comes from the same chick to chook, pumped and plucked production line. The Colonel may have preserved the secret of his recipe but somewhere someone has made a fortune selling a KFC-esque coating. It satisfies some nosmic pareto rule of being close enough to the real thing, without triggering the memory that visits to KFC, like dreams of what you should have done, also leave you with a lingering sense of regret. No. The key to quality is in the potato based accompaniment. The French fry, the chip, the wedge, whatever your poison (and chemically some of them may be), therein lies the true test of your down-at-heel eatery. At the moment of provision, as they land on the plastic tray with its paper flier, they always smell heavenly. This time, they promise, this time you won’t leave the premises feeling a little dirty. Now you face a dilemma. Hell hath nothing so noxious as cold cheap friend chicken. The coating comes away and the oil, emulsified with the water used to bump up the weight of the bird, oozes out over the surprisingly small amount of actual meat. Now you are India Jones facing the leap of faith. Can your chips survive the waiting? If you’re having a burger it is a no brainer. You pour out the chips into the other side of the polystyrene box, load up on ketchup and munch fries three at a time, the burger will bear the waiting. But the two piece chicken with chips meal is where the rubber hits the road. You have to go chicken first, but the clock is ticking. Behold the half life of chips. 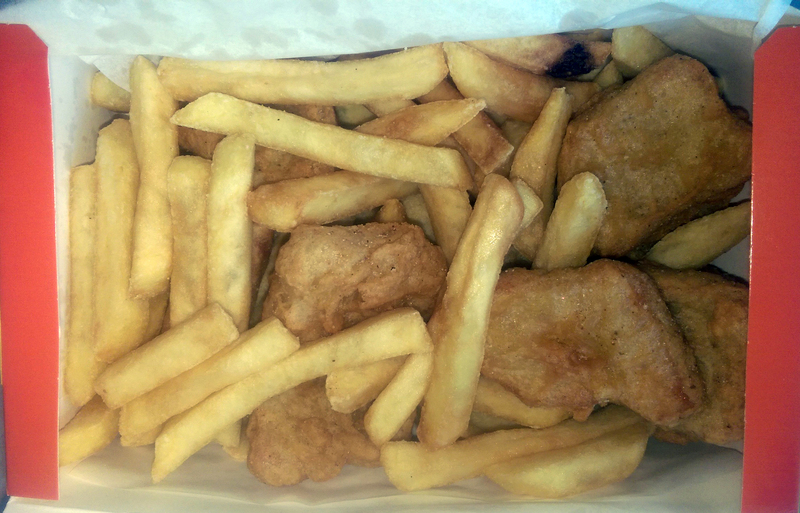 When they land in your tray the chips are a passport to unearthly wonders. The potatoes have been skinned by rolling them gently on the thighs of dusky maidens. Unicorns cut and sliced them with their horns, and they have not so much been fried as bathed in soothing unguents. That phase only lasts about twenty seconds, and if the chips have been sitting in the metal jobber for any length of time before serving then forget it. Don’t feel aggrieved. Even if the chipista has made them fresh, unhurried by the queue behind you, you won’t make it to your seat before the peak of taste has passed. Eat them en route or never know this pleasure. The next phase is the crucial one. The chips are still hot, but they seem to be very poorly insulated. The temperature drops rapidly. During that second phase the ubiquitous red sauce will see you right with a thin swipe. Phase three comes all too quickly. The texture has gone from light and fluffy inside, to a cardboard tube wrapped in a condom. Ketchup can still save you but you had better hurry because in Phase four a hod carrier will arrive to ask if he can use your lunch to build a wall. It’s not called fast food because of the speed with which it is served, but because of the speed with which you have to eat it. How long it takes to get through the phases tells you all you need to know. If you are in phase four by the time you get to the table from the counter then get up and leave now. No good will come of this. Take the lesser pleasure of having bought fast food, and be content with that. If you are still in phase three by the time you finish the chicken then you’ve probably found a keeper. This is your local every bit as much as the pub. And if you are in phase two by the time you are consuming the chips then enjoy life while you can, because sooner rather than later you will choke to death from eating chicken too fast. This was a very funny trip down memory lane. I haven’t eaten chicken in a public place for twenty plus years (I will eat chicken at home, because I know how they have lived and died). But way back when my kids were little, there was nothing we liked better than a KFC, and you describe it all perfectly.